I got sucked into a carpet shop last night. Wandering the old medina in the center of Tunis, my husband and I came across the clerk who’d checked us into the hotel, now on his day off. He’d love to show us a handicraft exhibit! Right here in the souk! Only one day! Closing in an hour! We let him shepherd us down alleys and through hallways lined with shops closed for prayer time. It’s a little sketchy, but he’s from our hotel, and there’s two of us. 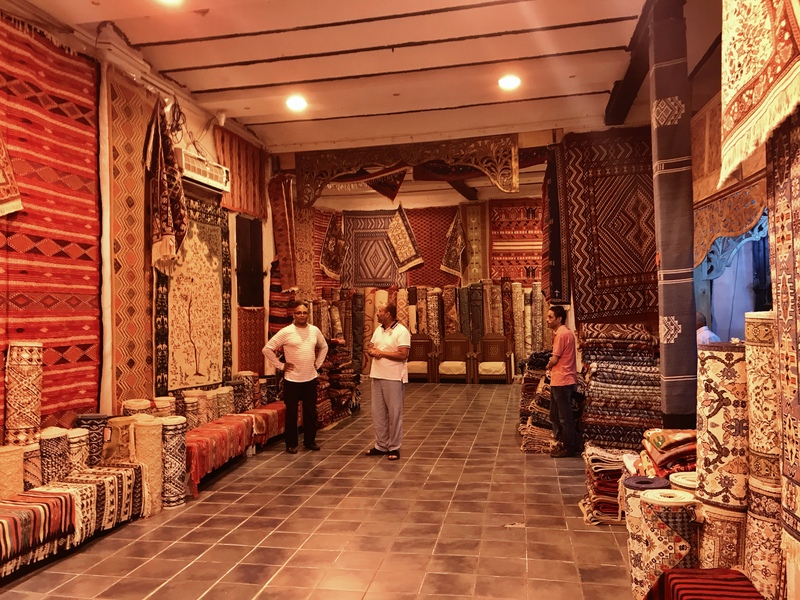 He takes us to a souvenir store built into a former palace, and the shop owner escorts us through shelves of turquoise jewelry and caftans and mini-mosaics. 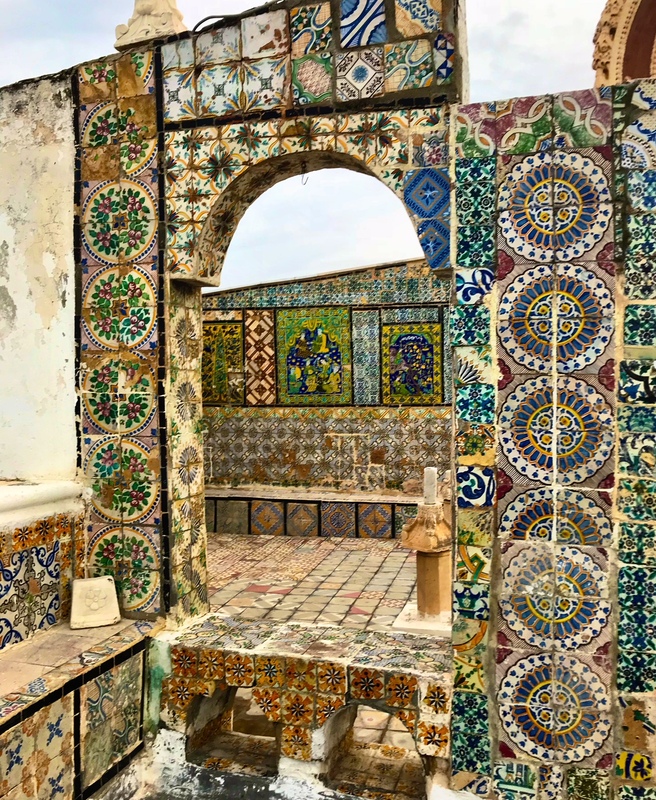 We go up more stairs, and outside there’s a reasonable view of the roofs of Tunis and a terrace covered in fantastically painted tiles. The colors and patterns are some of the most beautiful decorative work I’ve ever seen. Absolutely worth getting dragged to the back of the souk. Going back downstairs, we turn left instead of right, into a room full of rugs. The “exhibit” is a carpet showroom. Tea is brought. The merchandise turns out to be lovely, authentic, government-certified to be exportable, and reasonably priced. Still quite expensive, but $750 for a large handmade Berber, beautifully designed in 100% wool, is not bad if you’re a person who buys really nice home decor (I’m not). We’ve considered a carpet before. It would be a nice souvenir of our years in the Middle East, something we’d own forever, something hard to get somewhere else, something not touristy and awful. So we consider the carpets here. After half an hour, we are genuinely interested. But after another half hour, the blue ones we like are too large for the room in our house that would suit a blue carpet. The green ones are too small for the room that could host a green carpet. I don’t want a white one—one juice spill and we’re screwed. That pattern is great but not that color. That color is great but those embroidered lozenges are a little busy. But the shopkeeper and his three assistants have worked so hard to sell us these carpets, and they are truly beautiful. I’m pretty sure that with a starting price of $750 (“Includes shipping! If you take it with you, we give already 20% off!”) I could walk out of here with a $400 rug. The mint tea is strong and sweet, and my husband and I discuss our budget in rapid-fire undertones. 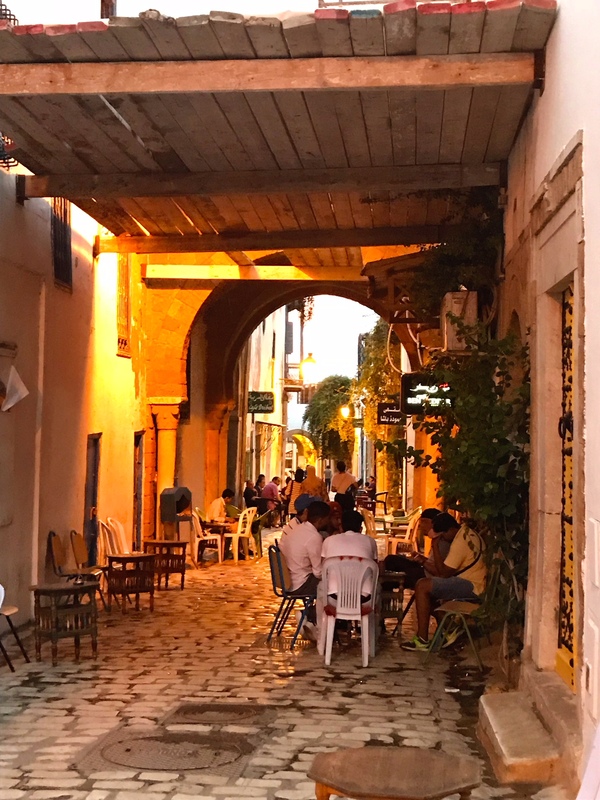 Everyone in Tunis has a minimum of three languages, but speaking very quickly gives a little privacy. We are now firmly in the market for a gorgeous rug. Just not one of these. I am truly sad to walk away from the beauty of this traditional craft. I am impressed and moved by the care and effort that have gone into 20,000 hand-tied knots per square meter. The price and time are right, but I do not have a suitable space in my home for any of these particular carpets. We thank the shopkeeper profusely. We elude the guy from our hotel (who wants to take us to a perfume shop next) by saying we’re late for dinner, and lunge randomly into a dark passageway because we are so embarrassed and sad we had to say no, even though saying ‘no’ was the right choice. Let the carpet find a home where it will sparkle with beauty instead of clashing with my walls. With someone who loves that exact pattern and color, who also appreciates the workmanship and investment of the craftswomen who made them. Allison K Williams is Brevity‘s Social Media Editor. She highly recommends Tunisia. Keep up with her adventures by joining the (free, occasional) I Do Words TinyLetter. Nicely done. As an editor, my floors would be covered with carpets and I would repaint the walls. In fact, that is what I have done. Ha! I will think of carpets every time I receive a rejection. Thank you! A beautiful lead to your point. I was wondering what this story was REALLY about. An interesting comparison. I had the exact same experience in Tunis and Rabat and also have enough rejection letters to carpet my entire home! A great read. You make an excellent point. They are just not that into whatever has been rejected-not that the submission was not excellent. You are currently reading I Wish I Wanted That Carpet at BREVITY's Nonfiction Blog.